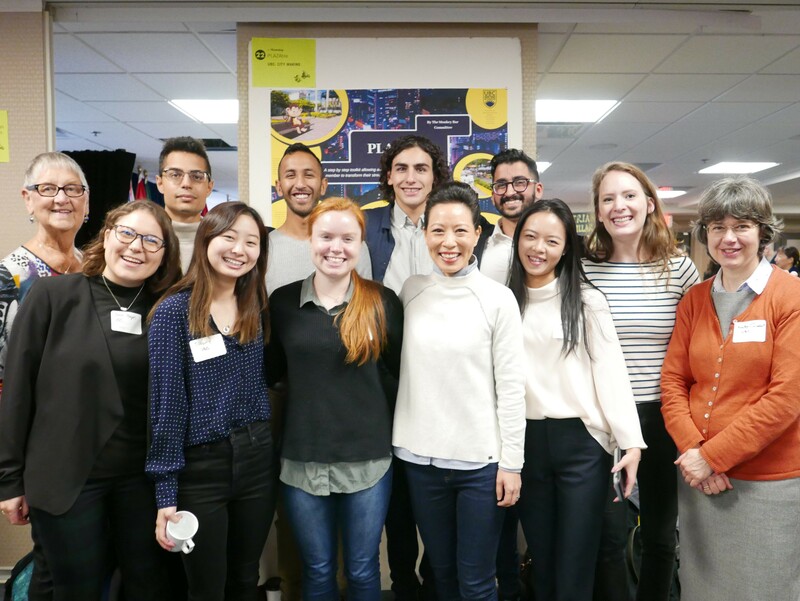 Student teams from PLAN 211, led by course instructor and SCARP Postdoctoral Fellow, Su-Jan Yeo, showcased their course-end projects at Vancouver City Hall for the biannual HUBBUB event on Friday Nov 30th 2018. Organized by CityStudio Vancouver, HUBBUB is an end-of-semester celebratory and networking event featuring innovative solutions developed by students from UBC, SFU, BCIT, Langara College, and Emily Carr. As part of the "Ideathon Challenge" pedagogic experiment in PLAN 211, student teams in this semester's cohort explored the challenge of pavement-to-plaza activation with the overarching goal of creating an innovative evaluation framework in the form of a “toolkit”. The theme and scope of this semester's challenge was crafted with support and collaboration of CityStudio Vancouver and City of Vancouver staff. Photo: PLAN 211 students; Dr. Heather Campbell; Dr. Su-Jan Yeo; Rebecca Mayers; Jacqueline Hunter; Gina Thorstenson.